One field that will benefit from nanotechnology is filtration using membranes. Covalent Partners, LLC (Hayward, CA) inventors Joshua W. Kriesel, Donald B. Bivin, David J. Olson and Jeremy J. Harris developed a catalog of nanofilms with polymeric components that can be made impermeable to viruses and larger biological species. The films are used to make selectively permeable membrane barriers for the separation or filtration of materials from fluids, according to United States Patent 7,595,368. The 134 page patent divulges a variety of nanofilms for material separation. Conventional membranes used in a variety of separation processes can be made selectively permeable to various molecular species. The permeation properties of conventional membranes generally depend on the pathways of transport of species through the membrane structure. For example, while the diffusion pathway in conventional selectively permeable materials can be made tortuous in order to control permeation, porosity is not well defined or controlled by conventional methods. The ability to fabricate regular or unique pore structures of membranes is a long-standing goal of separation technology. Covalent’s discoveries are a step closer to that goal. 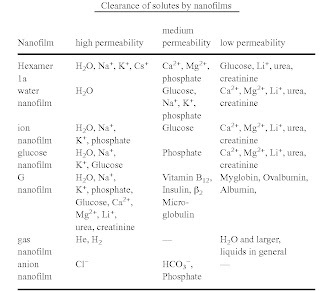 Selective filtration and relative clearance of solutes is exemplified in the Table Clearance of Solutes by Nanofilms, where the heading "high permeability" indicates a clearance of greater than about 70-90% of the solute. The heading "medium permeability" indicates a clearance of less than about 50-70% of the solute. The heading "low permeability" indicates a clearance of less than about 10-30% of the solute. Nanoflims for filtration were prepared from amphiphilic species and one or more polymeric components. The amphiphilic species or components may be oriented on an interface or surface. Nanofilms may be prepared by coupling one or more of the components. The nanofilms may also be deposited or attached to a substrates. SouthWest NanoTechnologies (SWeNT) CoMoCat® manufacturing process produces SWNT of high quality at very high selectivity, and with a remarkably narrow distribution of tube diameters. In this method, SWNT are grown by catalytic CO disproportionation (decomposition into C and carbon dioxide) at 700-950°C in flow of pure CO at a total pressure that typically ranges from 1 to 10 atm. The technology was invented by University of Oklahoma Professor Daniel Resasco, patented by the University and licensed to SWeNT. Figure CoMoCat® Process as Presented in U.S. Patent 7,585,482. 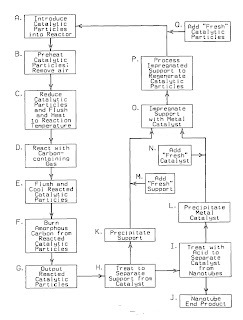 The figure shows a series of process steps A-Q which represent a method of continuous catalytic production of carbon nanotubes. Southwest Nano Technologies Inc. (SWeNT) located in Norman, Oklahoma is commercializing this method. The process was developed at the University of Oklahoma by Prof. Daniel Resasco, who is SWeNT’s chief scientist, a company founder and directs the carbon nanotube research team that invented the CoMoCAT® catalytic process. The process is able to grow a significant amount of SWNT in a couple of hours, maintaining a high selectivity. The process is protected by U.S. Patent 7,585,482. In the future tires with nanosensors will wirelessly warn a driver if the vehicle is about to experience a blowout or if the tire is experiencing some other sort of trouble that demands attention. The sensors may be configured to simultaneously provide data related to one or more factors including temperature, pressure, sidewall flex, stress, strain and other parameters. The sensing system obtains data useful for monitoring tire properties or characteristics including tire tread wear, tire pressure, tire temperature, and sidewall flex. Non-uniformities in the tire can also be monitored and/or discovered such as bulges, punctures, broken threads or cords. Other irregularities can be determined in this manner such as vehicle suspension anomalies due to irregular tread wear or footprint changes. The information is relayed to the driver through a computer display. The radio frequency (RF) sensors are embedded in the body cord ply material, the belt layer material, and the sidewall material, each sensor being sufficiently small enough to avoid being an occlusion. For example a sensors can activate to provide signals at a threshold temperature corresponding to an undesirable tire temperature or the sensors deactivate and cease providing signals at a threshold temperature corresponding to an undesirable tire temperature. The sensor length-scales range from nano- to micro-scale devices that are small enough to avoid becoming occlusions within the tire. The sensors may be LCD sensors, conductive polymer sensors, bio-polymer sensors and polymer diodes suitable for sensing data during the operation of the tire. A power circuit using energy generated by the tire provides power to the sensors. The data collection device includes an antenna for receiving the sensed data in the form of electromagnetic radiation. A data processor is connected to the data collection device for processing the sensed data in order to synthesize information about the tire properties being monitored. The data processor can be a computing device such as a dedicated processor, a conventional computer such as a personal computer or laptop, or other known electronic devices for collecting and processing signals obtained from wireless sensors. Though the examples described are in reference to pneumatic vehicle tires, it should be appreciated that other tires--such as airless and solid tires--and other elastomeric articles, including air springs, conveyor belts, roofing materials, sporting goods, etc. may also be monitored using a sensing system of similar construction and implementation. Hot-wire anemometers have proven useful for macroscale measurements. For example, hot-wire anemometers are used to monitor air flow within automobile engines, ventilation and heating ducts, and the like. A hot-wire anemometer uses a heated wire positioned within the flow of media, such as gas, liquid, particle-laden liquid, or the like. As the media flows past the hot wire, heat is transferred from the hot wire to the media, cooling the hot wire. Flow can be determined from the temperature variation effects on the hot wire. Less success has been achieved in using hot-wire anemometers in a microscale environment, such as microfluidics. Conventional macroscale hot-wire anemometers cannot easily be scaled into microscale dimensions. For example, as the scale of components is reduced, the components can become fragile and be easily damaged during the fabrication process. While micromachining techniques can be used to form small-scale structures, micromachining techniques are typically complex and time consuming. Hewlett Packard inventors Douglas Snell and Theodore Kamins succeeded in creating a nano-anemometer by growing a nanowire to span an open area between a pair of electrodes. The nanowire is coupled to a sensing apparatus to form a hot-wire nano-anemometer. According to U.S. Patent 7,591,193, multiple nanowires can be used to increase the sensitivity of the nano-anemometer or to provide for multiple points of measurement. Various units of measure for flow rate can be obtained. For example, flow rate may be expressed as a velocity (e.g. distance/time), mass times velocity, mass per unit time, volume per unit time, etc. For example, from a flow velocity measurement, flow volume rate can be calculated by taking into account the dimensions of the open area through which the media is flowing. Various other measures, such as total flow over a given time interval, can also be obtained, as will be appreciated. While high resolution measurements of flow rate or flow volume can be performed, coarse measurements can also be performed. For example, the nano-anemometer can be used to determine presence or absence of a flow through the open area. Measuring flow velocity of fluids is helpful in a variety of application, including for example research, metering, monitoring, and similar applications. Cortec Corporation (St. Paul, MN) earned U.S. Patent 7,588,820 for packaging films to inhibit corrosion in packaged goods that include nanoclays, polymers and vapor phase corrosion inhibitor (VCI) materials. The three types of materials were blended to produce masterbatches with final compositions of 1-2% VCI chemicals and 2-10% nano-clay particles. The films prepared from the blended material showed improved physical properties. The films have both vapor phase corrosion inhibiting characteristics as well as corrosion agent barrier characteristics. Nano-clay particles dispersed in polymeric substrate resins, such as polyethylene resin, are available commercially under the trade name "Nanoblend 2001", from Poly-One Corporation of Avon Lake, Ohio. The Nanoblend 2001 material is preferably blended with a polymeric substrate resin such as polyethylene to produce a mixture having between about 2 and 10% by weight nano-clay particles. Nano-clay particles mixed with polymeric resins are also available from other commercial sources. The packaging film may be formed as a multiple layer co-extruded film, wherein a first polymeric layer is disposed between a second polymeric layer including nano-clay particles, and a third polymeric layer including one or more corrosion inhibitor materials, according to inventors Robert Berg, Arthur H. Ahlbrecht, Margarita Kharshan, and Boris A Miksie. VCI materials vaporize from the film into the enclosed package to minimize corrosion caused by any moisture entering into or contained within the enclosure. The film is formed through a single-step process. Such a one-step formation operation may be performed in a blown film extruder. The market for all types of flexible packaging materials is expected to exceed $26 billion in 2010. There are also reports forecasting that industrial application of carbon nanotubes will remain unpractical until its price falls below $2/pound, i.e. 0.4 cent/g, and it needs a production rate of 10,000,000 pound per year or about 12.5 tons per day to bring the price down to this level. Prices are currently about $200-$250 per pound for industrial grade multiwall carbon nanotubes and much higher for other grades. Novel process and reactor technology are the keys to the mass production of carbon nanotubes and reducing the price. 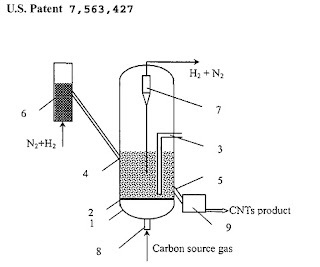 Tsinghua University (CN) researchers reveal in U.S. Patent 7,563,427 a method for the continuous production of carbon nanotubes in large quantities in a nano-agglomerate fluidized bed. The process is comprised of the following steps: loading transition metal compounds on a support, obtaining supported nanosized metal catalysts by reducing, dissociating, or catalytically decomposing a carbon-source gas, and growing carbon nanotubes on the catalyst support by chemical vapor deposition of carbon atoms. The carbon nanotubes are 4 to 100 nanometers (nm) in diameter and 0.5 to 1000 microns in length. The apparatus is simple and easy to operate, has a high reaction rate, and it can be used to produce carbon nanotubes with a high degree of crystallization, high purity, and high yield, according to inventors Fei Wei, Yao Wang, Guohua Luo, Hao Yu, Zhifei Li, Weizhong Qian, Zhanwen Wang and Yong Jin. The carbon nanotubes are free of amorphous carbon deposits. The apparatus comprises a main reactor (1), a catalyst activation reactor (6), a gas distributor (2), a gas-solid separator (7) and a product degassing section (9), wherein the catalyst activation reactor (6) is connected to the main reactor (1), the gas distributor (2) is placed in the bottom of the main reactor (1), the gas-solid separator (7) is arranged at the top of the main reactor (1), the main reactor (1) is provided with heat exchange tubes (3) and a gas feeder at its bottom, and the product degassing section (9) is connected to the main reactor (1) though a product outlet (5). By properly adjusting the reaction rate, operating conditions and fluidized-bed structure, the reactor bed is kept in an agglomerate fluidization state and so continuously mass produces carbon nanotubes with a high degree of crystallization, high purity, and high yield. In 2008, a new kind of flexible, stretchable, and transparent loudspeaker made with carbon nanotube (CNT) film was invented by a team led by Professor Fan Shoufan and Associate Professor Jiang Kaili from Tsinghua’s Department of Physics. The CNT film loudspeaker possesses all the functions of a voice-coil loudspeaker as well as the merits of being magnet-free and without moving components. The nano-thick CNT films are flexible, stretchable, and transparent and can be tailored to any shape and size to fit various rigid or flexible insulating surfaces such as walls, roofs, windows, flagpoles or even clothes. 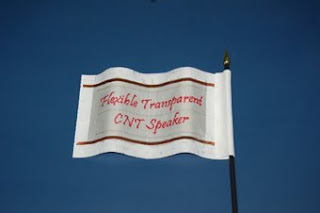 Several CNT films can also be configured into a large-size loudspeaker. More than 16,700 nanotechnology related U.S. Patents have been granted as of the end of 2008. By September 1st 2009, 3100 more nanotechnology related patents had been issued, more than any other year in just nine months and more than all the nanotechnology patents granted in 1999 and the years prior (2890 total patents). More than 38,600 U.S. Patent Applications related to nanotechnology were waiting for approval as of September 1, 2009. The table “U.S. Nanotechnology Patents by Year 1999 & Prior through 2008” lists the number of patents granted each year since 1999 through September 1, 2009. The number of patents has increased each year and is expected to continue at the rate of more of 3500 to 4000 new patents a year for the next few years. Source: Alton Parrish and Innovative Research and Products Inc.